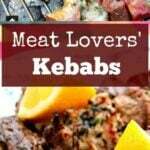 Meat Lovers’ Kebabs! 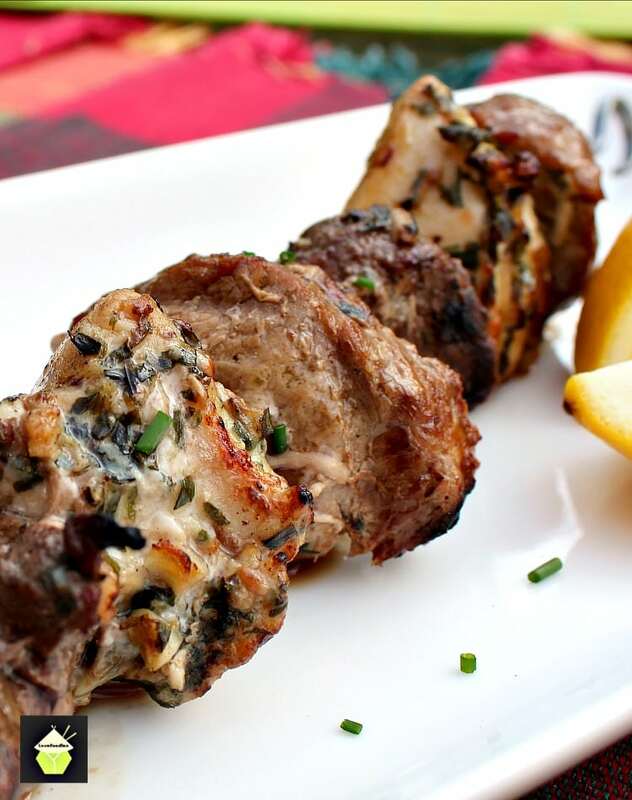 This is a really easy and quick recipe for making kebabs just for meat lovers! Here, I have used 3 different types of meat, beef, pork and chicken, and used 3 different marinades. I have to say, this recipe is by no means cheap as the meat I used is good quality and tender, but for special occasions this is a lovely recipe. Most of you will no doubt know one or two meat lovers, maybe you are too! So this is going to certainly please them. 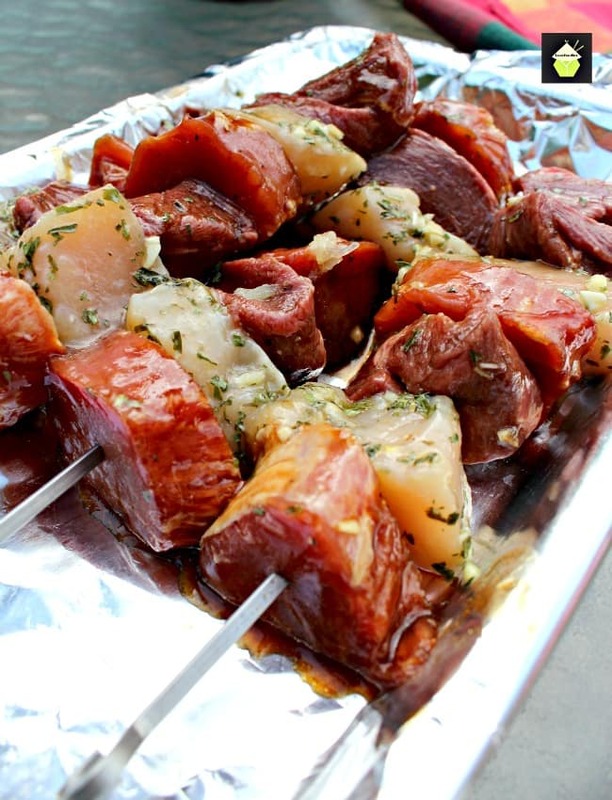 It’s a very easy recipe, you simply need to divide the meats and then marinade and skewer, then they’re ready for the BBQ. I have also tried these indoors on a grill pan and they worked equally as well as on the BBQ. Here, I served these with some baby garlic potatoes and a Simple Refreshing Salad, recipes of which you can see at the end. So I hope you will get to try these soon, and please enjoy. NOTE: Please try and choose thick cuts of meat so you are able to cube them. 1/2 Teaspoon finely chopped fresh ginger. 1. Cube all the meat so they are roughly the same size. I made approximately 1 1/2 inch cubes of each and got 9 cubes from each of the beef, pork and chicken. NOTE: If you like your beef medium rare, please cut the chicken a little smaller so it cooks faster than the beef, or put the chicken on a separate skewer so it has more time to cook. 2. Place the pork, beef and chicken in to 3 separate bowls and add the marinade ingredients relating to each meat. Combine the marinade well. 3. Using metal skewers if you have (the heat will conduct better through the meat), start by pushing a piece of beef, then pork, then chicken, and repeat, so you have 2 or 3 cubes of chicken, beef and pork on each skewer. Place on a tray and cover and refrigerate for 20 minutes then BBQ when you are ready! *** If you have people all wanting different done-ness for the beef, I suggest you make up beef skewers separate so you can control how well done or rare they are, otherwise, this method of having 3 meats on 1 skewer works nicely for medium done ness of the meat. 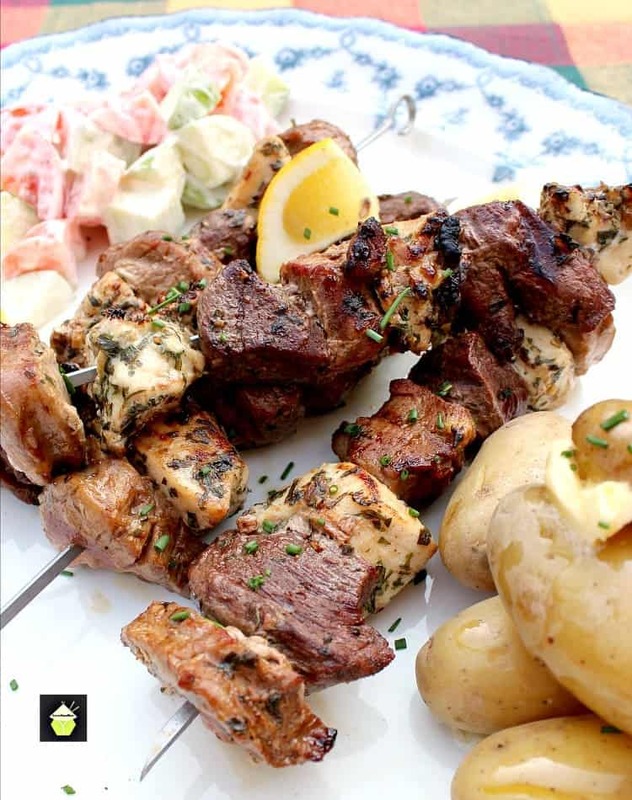 Whilst grilling, turn the skewers often so they cook evenly and serve with some lovely salad and baby Garlic Potatoes. Yummy! Meat Lovers' Kebabs! 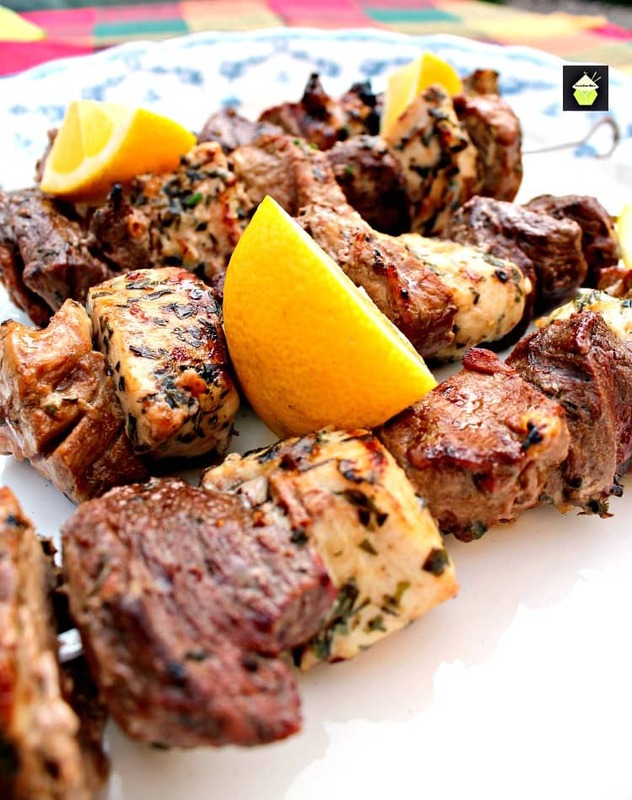 This is a really easy and quick recipe for making kebabs just for meat lovers! Here, I have used 3 different types of meat, beef, pork and chicken, and used 3 different marinades. I have to say, this recipe is by no means cheap as the meat I used is good quality and tender, but for special occasions this is a lovely recipe. Most of you will no doubt know one or two meat lovers, maybe you are too! So this is going to certainly please them. 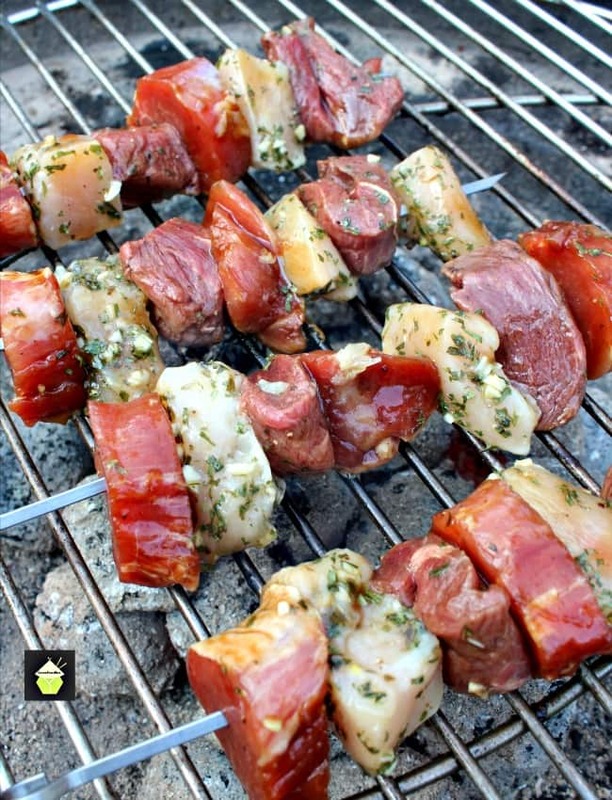 It's a very easy recipe, you simply need to divide the meats and then marinade and skewer, then they're ready for the BBQ. I have also tried these indoors on a grill pan and they worked equally as well as on the BBQ. Here, I served these with some baby garlic potatoes and a Simple Refreshing Salad, recipes of which you can see at the end. So I hope you will get to try these soon, and please enjoy. Cube all the meat so they are roughly the same size. I made approximately 1 1/2 inch cubes of each and got 9 cubes from each of the beef, pork and chicken. Place the pork, beef and chicken in to 3 separate bowls and add the marinade ingredients relating to each meat. Combine the marinade well. Using metal skewers if you have (the heat will conduct better through the meat), start by pushing a piece of beef, then pork, then chicken, and repeat, so you have 2 or 3 cubes of chicken, beef and pork on each skewer. Place on a tray and cover and refrigerate for 20 minutes then BBQ when you are ready!